In June last year contributor Antoine Leboyer wrote here about the trivialisation of music at Paris' venerable Théâtre du Châtelet with these prophetic words - 'There are no real operas save, perhaps, a rarity by Roussel which looks more like a vehicle for Bollywood director Sanjay Bhansali. Maybe this reflects the new director’s vision for classical music, but, for Parisian audiences, Le Châtelet is becoming the temple of crossover and mass-market entertainment'. Andrew Clements' review of the Roussel rarity, Padmâvatî, in today's Guardian confirms that Antoine's prediction was spot on - 'A director of real flair and imagination might breathe life into the piece. 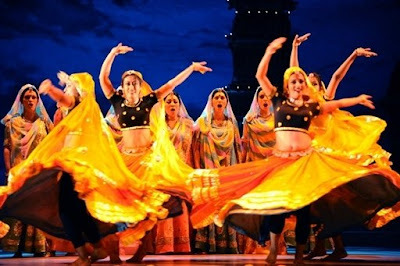 But the Châtelet production has been handed over to an all-Indian team led by Mumbai film director Sanjay Leela Bhansali, who has simply come up with a series of inert tableaux, to which some coarse acting and risible choreography adds nothing at all. It is just Bollywood camp, and even the on-stage presence of a horse, an elephant and a young tiger (the python promised in the cast list sadly did not materialise) as well as some very dodgy moustaches is not enough compensation'. Now read about Aida with no clothes.